At a meeting of the Council's General Purposes Committee held on 3 April 1935 it was recorded "The Committee approved a draft Address of Congratulations to His Majesty the King on the occasion of his Silver Jubilee, and it was decided to recommend that the Common Seal of the Council be affixed to the Address." The following minute recorded "It was reported that Messrs Paull & Co Ltd of Martock had expressed their regret that they could not undertake a scheme of decoration of the Town Hall, Municipal Offices and Library on the occasion of the Silver Jubilee, but that they had a large quantity of bunting, flags, etc. for sale or hire. After discussion it was resolved that the Mayor, Town Clerk and Borough Surveyor be authorised to prepare and arrange for the carrying out of a scheme for the decoration of the buildings, at a cost not exceeding £70." "That the staff of the various schools be asked to appoint a representative Committee to organise the proposed Athletic Sports, to assist in connection with the serving of the Tea and distribution of Mugs, and to make such other arrangements as they may consider desirable for the entertainment of the children during the afternoon and evening. That the children's Athletic Sports and Tea be held in the Mudford Road Playing Fields, in view of the fact that the Westland Aerodrome ill not be available for the purpose. That a quotation by Mr William York of Birmingham for supplying the necessary number of 1¼" British made White Metal Plated Commemorative Medals, complete with tricolour ribbons and pins at the price of 39/- per gross, be accepted. [Nine and a half gross - 1,368 - were ordered at 38/- per gross and presented to the children who attended the planned cinema performance]. That the Playing Fields be open to the general public in the evening of 6 June free of charge. The Town Clerk was asked to discuss with the Manager of the Western Temperance League the question of arranging for sufficient refreshments to be available for sale to the public on the occasion." In addition to the above, £6 6s 0d was paid to Professor Edmonds for entertaining the children with his Punch & Judy show at intervals throughout the afternoon, the Teachers' Committee were authorised to spend 10/- on sweets for distributing to the children (that's over £30 of sweets at today's value) and £5 5s 0d was allocated for prizes for the children's Fancy Dress Competiton. Many thanks to Vivien Cornelius for the above. 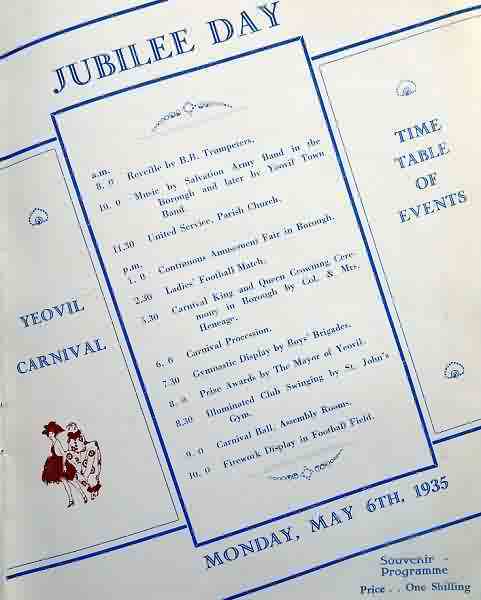 Monday 6 June 1935 was declared a public holiday and parties were held across the country in the glorious sunshine, including here in Yeovil, with fêtes, pageants and sports events to celebrate the Silver Jubilee of King George V.
Later that day the King and Royal Family appeared on the balcony of Buckingham Palace to floods of cheers from the crowd below. Due to popular demand, the King even waved from the same balcony for a few consecutive days later in the week. George V continued to mark the Jubilee throughout May by taking carriage rides through London as well as one through north London for Queen Mary’s birthday, on which they were accompanied by their two granddaughters: Margaret and the future Queen Elizabeth. During the celebrations the King received an extensive number of telegrams from across the globe with good wishes, both from heads of state and ordinary people. 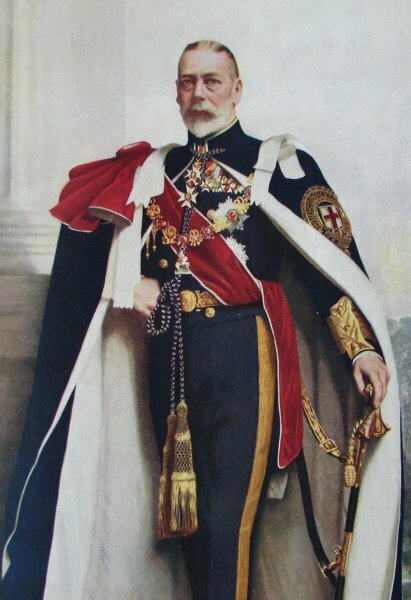 The public’s reaction to George V’s appearances over the celebratory period only confirmed the popularity of a Jubilee celebration as well as the esteem in which the King was held. In Yeovil, Jubilee day began at 8am with Reveille by the trumpeters of the Yeovil Boys' Brigade. This was followed at 10am with music from the Salvation Army band in the Borough and, later, by Yeovil Town Band. At 11.30 a united service was held in St John's church. During the afternoon a continuous amusement fair was held in the Borough, commencing at 1pm and a Ladies' football match kicked off at 2.30pm. At 5.30pm the Carnival King and Queen were crowned by Colonel and Mrs Heneage in a ceremony in the Borough followed at 6pm by the carnival procession. At 7.30pm the Boys' Brigade gave a gymnastics display followed at 8pm by prize awards by the Mayor of Yeovil, Alderman AHJ Stroud. This, in turn, was followed by an illuminated display of club swinging by St John's Gym and Boys Club. A grand evening Carnival Ball was held in the Assembly Rooms commencing at 9pm and, for those not lucky enough to have tickets to the ball, there was a free firework display in the football field at 10pm to round off the day. 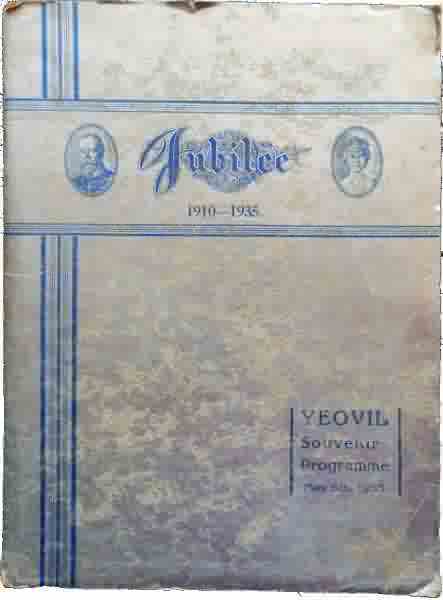 The 1935 Jubilee portrait of King George V.
Now sadly showing signs of its age, the silver-coloured cover of Yeovil's 1935 Souvenir Programme of events celebrating the King's Silver Jubilee. 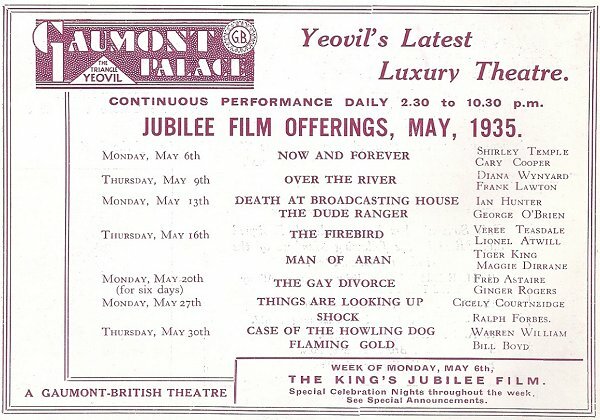 The programme of events as featured in the Souvenir Programme. 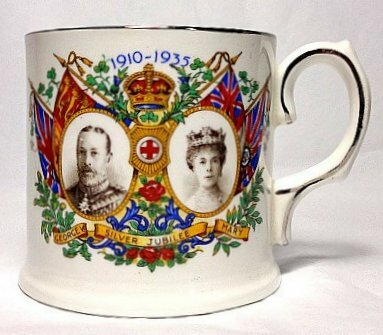 Commemorative Silver Jubilee mugs were presented to some 3,000 Yeovil schoolchildren. These were supplied by the Yeovil Co-operative Society at 5/6d per dozen. 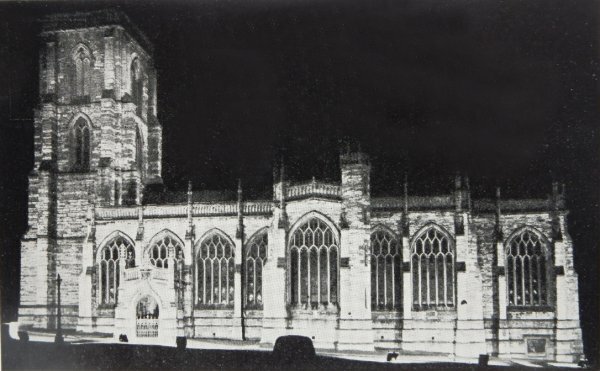 A postcard showing St John's church "Floodlit on the occasion of the Silver Jubilee, 1935, by the Yeovil Electric Light & Power Company Limited". The Town Council contributed £25 towards the costs of the floodlighting. 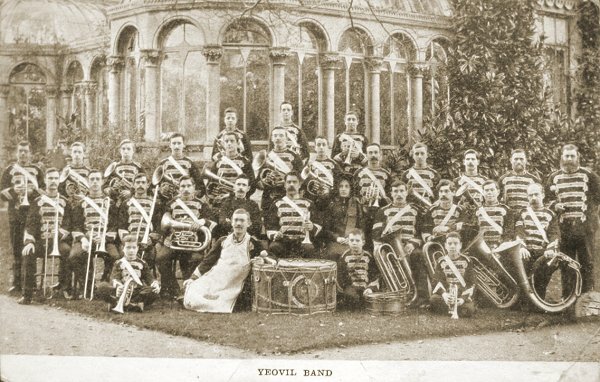 A postcard of the Yeovil band of the Salvation Army (albeit dating to around 1915).